Svenja arrived in Iceland and midnight and was pleased to figure out that there are bus connection to the city centre with super friendly and helpful staff even at 2am. The ride was approximately 45 minutes and the ticket price was 1,950 ISK. She recalled that next morning they were exploring places around when they encountered Bjornsbakari, she added: "we had face-sized, glaze covered cinnamon buns for breakfast. We saved half for tomorrow because we just couldn’t finish them! They were delicious and totally affordable." After the breakfast they continued walking to the city centre, Svenja and her friend took a bridge over Lake Tjornin, which gave them a perfect view on Fríkirkjan in Reykjavik. Then they headed towards Hallgrimur, Svenja noted: "The hill up to Hallgrimur, or mountain if you want, is steep but totally worth the climb! But the view from above is like no other, but don't worry, there is an elevator!" Apart from exploring the local tourist attractions, the girls decided to do some shopping in Reykjavik. The most convenient shopping area for them was between Skolavoroustigur and Laugavegar streets. 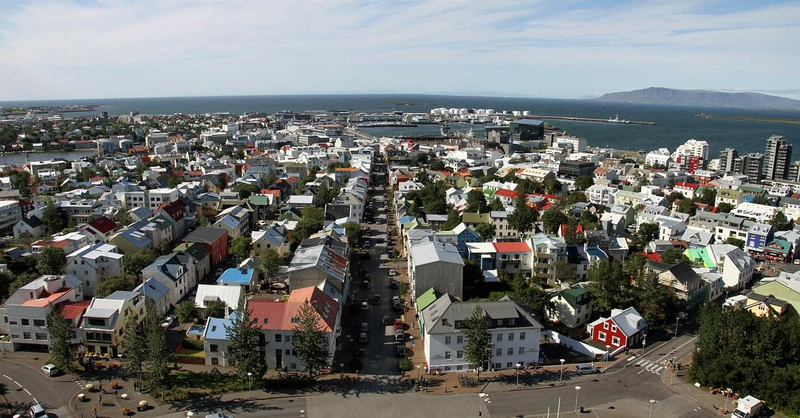 Svenja recalled: "We took the first one on our way back down from the Church of Hallgrimur and we found a number of little restaurants and shops, including a supermarket with decently priced water and a bookstore with free wifi hidden in the reading nook". On the way back to the hotel, they went to see Parliament House and City Hall and passed 871, a museum experience about the first settlements. After a long day walking around the city, they were looking forward to the Golden Circle trip the next day and of course half of cinnamon bun, that they saved for the morning!